Hi-Tech Pharmaceuticals NitroPro is a unique protein supplement with a carefully designed composition. The product provides 24 g of top-quality protein per serving (85% WPH), including 75% peptide-bound amino acids (PBAAs), and 8 g of branched-chain amino acids (BCAAs). The supplement is probably the purest and the fastest preparation available on the market. Partial hydrolysis of the protein contained in it makes blood levels of amino acids, which can then be used efficiently by muscles, grow rapidly. Apart from that, the product contains components that are crucial for the structure and maintenance of muscle mass. Whey protein contained in the supplement was partly hydrolysed to smaller molecules, that is di- and tripeptides of the mass of 400-1000 daltons. In natural conditions, such peptides are a product of the digestion of macromolecular proteins in the human digestive system. When delivered to the organism in the form of short peptides, amino acids go through the circulatory system much faster, as they take less time to be digested in the gastrointestinal tract. Thanks to that, they can be used by muscles faster and to a greater degree. More efficient use of the amino acids provided helps muscle mass to grow faster. The above-mentioned peptide-bound amino acids (PBAAs) are even 16 times faster in comparison with free amino acids. That makes them perfect for taking right after waking up in order to prevent muscle catabolism, and to increase blood amino acid levels rapidly before a spontaneous training. They are an excellent structural element that promote muscle protein synthesis, the development of lean muscle mass, and an increase in strength. The product is a complex protein supplement providing all the essential exogenous and branched-chain amino acids. The protein contained in it was subjected to the processes of microfiltration and ultrafiltration, which allowed to remove excess lactose, cholesterol, carbohydrates, and fats from it. In order to achieve top efficiency, the supplement was designed in a way that allows to provide all the components necessary to the development of muscle mass. As a result, the product is characterised by an increased NNU marker (net nitrogen utilisation), which provides information about the extent to which consumed protein and the amino acids formed from it are used for protein resynthesis in the organism. In the case of this supplement, the marker is six times higher than in other protein supplements. BCAAs, branched-chain amino acids, are a group consisting of valine, leucine, and isoleucine. They are extremely important for the normal growth of tissues, particularly muscle tissue. At the same time, they are part of a greater group – exogenous amino acids, that is those that cannot be synthesised by the organism and must be delivered with food. Branched-chain amino acids support the biosynthesis of proteins in muscle cells, enabling their faster growth and proper regeneration. Additionally, leucine has the ability to activate kinase mTOR, which increases the speed of protein production by affecting the processes of transcription and translation. Interestingly, a positive correlation has been observed between an increased supply of branched-chain amino acids and elevated levels of anabolic hormones in the organism (insulin, growth hormone). It is also worth mentioning that BCAAs have a significant effect on reducing the feeling of post-workout tiredness. They reduce the concentration of tryptophan, which is a precursor in the pathway of the synthesis of serotonin, a hormone responsible for sleepiness and fatigue. BCAA supplementation is recommended by professional athletes because of its positive effect on faster regeneration, stimulated protein biosynthesis, and, consequently, faster growth of lean muscle mass and strength. To sum up, Hi-Tech Pharmaceuticals NitroPro is a top-quality protein supplement providing great hydrolysed protein. It provides easily absorbable amino acids that can be used as structural material for muscles shortly after consumption. The product beats every other supplement on the market thanks to its extremely fast and efficient activity as well as a high content of PBAAs and BCAAs in each serving. Mix 1-2 scoops in 300ml of water and drink 2–3 times a day. The product guarantees a fast and long-lasting amino acid boost, so it is a good idea to use it after waking up or directly before workout. It is also worth taking on non-training days as well in order to boost regeneration and muscle growth. To achieve the desired effects faster, I recommend combining it with creatine supplementation. 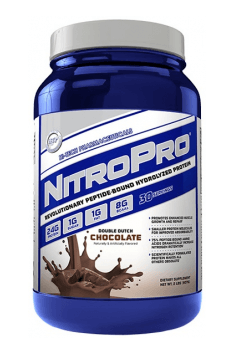 NitroPro® blend of hydrolyzed whey protein, consisting of 75% (Hi-Tech) peptide-bound amino acids (PBAAs), micro-filtered whey protein isolate, ultra-filtered whey protein isolate, whey protein concentrate, Naturally Sweet ™ (blend of erythritol, maltitol, maltodextrin, xylitol, tagatose, sucralose [‹ .0005 gm]) ,natural and artificial flavor, xanthan gum, and cellulose gum.